Chickpea Fritter Sandwich with Hummus | Naturally. With toddler eating patterns taking full force in our house, I like hand-held items more often than not. This fritter sandwich was slightly born out of a combination that was requested by the two year-old: chickpea fritters and hummus. My child loves hummus and would dip anything in it- case in point, it was watermelon yesterday. But I love the idea of using two components, ones I would normally make ahead of time in a lunch, that are easy to throw together. Really any combination of fritters/vegetable cakes with hummus/any kind of spread would work. 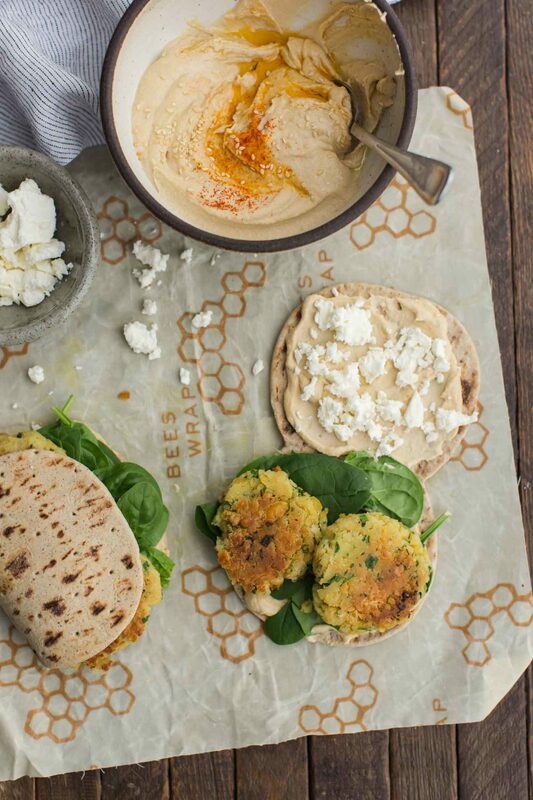 Hearty sandwiches featuring easy-to-make chickpea fritters and homemade hummus. Perfect for a weekend lunch or lunch using leftovers. Make chickpea fritters and hummus according to directions. 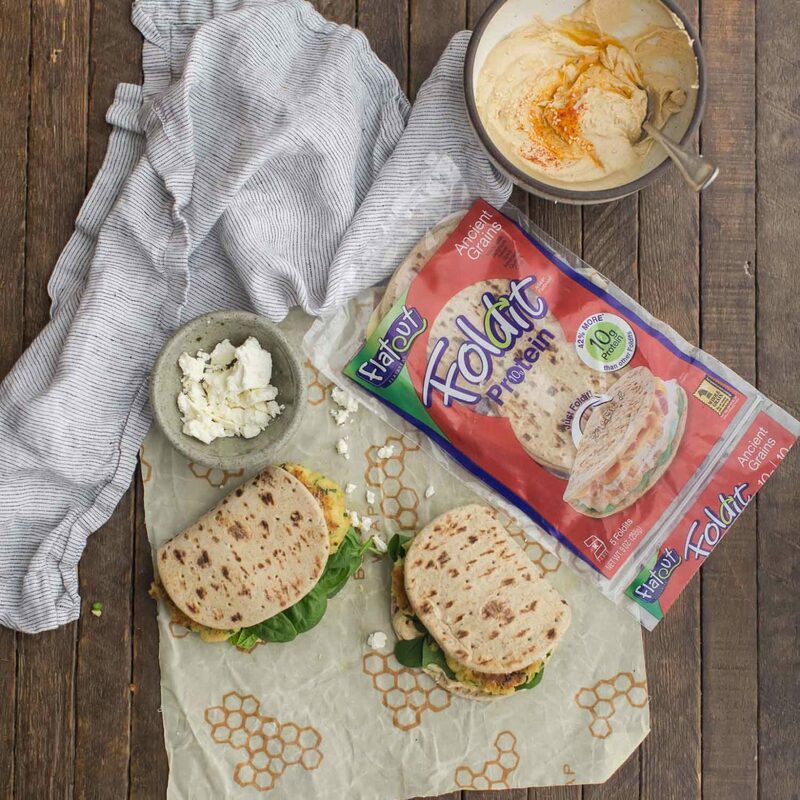 Save out 4 chickpea patties and ¼ cup hummus to use on these sandwiches. 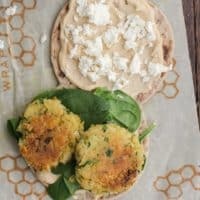 Assemble the sandwiches with 1 tablespoon hummus, a handful of spinach, two chickpea fritters, more hummus, and a sprinkle of feta. Tips & Tricks: the chickpea fritters and hummus can be made the day before. The fritters won’t be as crisp but they work well in this sandwich. 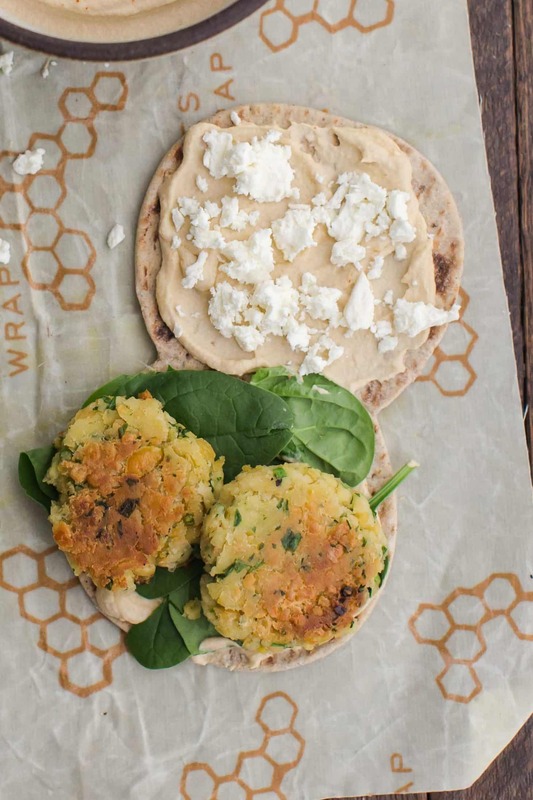 Fritters: Any leftover fritter will work in this wrap. I like to make a batch of vegetable cakes on the weekend and use throughout the week for sandwiches, salads, and grain bowls. A couple of my favorites include these corn fritters and these cauliflower cakes. Spreads: Beyond hummus, I’ll use any leftover spread or dip on my sandwiches. A couple favorites include harissa, carrot dip, or white bean dips. Greens: swap the spinach for lettuce or kale- I usually use whatever I happen to have on hand. What a great lunch idea … will try these next week!